He pointed out that the Virgin Islands would be in a better place if it had started discussions about independence years ago. “People got worried about whether I was talking about independence. If we had started those conversations and continued those conversations, we would have been in a better place,” Dr Turnbull said to an audience that included government officials. The Senior Pastor of the Cane Garden Bay Baptist Church compared the growth of the Virgin Islands to that of a child that refuses to leave his mother’s house. Dr Turnbull, who is the father of Second District Representative Honourable Melvin M. Turnbull, further urged the people of the territory that they should all stand and work together as one and the Territory would see a vast improvement. “Don’t let the strategy work; divide and conquer is their strategy,” emphasise Reverend Turnbull. As Dr Turnbull continued to advocate for independence, he commented that the United Kingdom is in a lot of trouble, not just with the Brexit but in more ways than one. According to Dr Turnbull, “I want you to watch what is happening. The mother country (United Kingdom) is in trouble. Brexit is only part of the bigger problem and they are totally confused as to what they are going to do,” explained Pastor Turnbull. 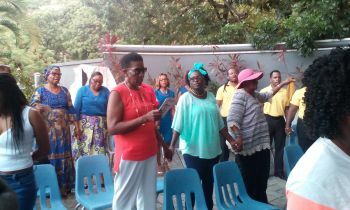 With all due respect dear Pastor, I do not believe that it is sufficient for you to simply speak of independence for the BVI without further annunciation of the pros and cons of such a drastic action. I suspect that you are motivated by and is perhaps seeking some sort of autonomy from the UK as others, in the Caribbean, has done before. Please take a look at those other islands in the Caribbean that has done just that and now compare them to the BVI and ask yourself whether or not they are now better off independent as compared to the BVI, and perhaps you will have your answer. My sense is that I think not. I totally agree with what you said. They need to let the people of the Virgin Islands know how they plan to sustain these islands without the assistance of the UK. What products do we have to offer/export. Do we have our own currency and if we get it what or how much will it value to the rest of the world. You have also mentioned the other Caribbean countries that have gone independent, they seriously need to take a look at them before independence and after independence. I don't understand why they are so adamant about independence, we can't depend on tourism and financial services to keep us going. Just take a look at the islands right now after all this rain. And they are all better off than the BVI -- Barbados, St. Lucia, St. Kitts, Guyana, Jamaica, and the list goes on. Only those who do not know their history would want to be under the dress of the Oppressors. I don't blame the people. I blame the education system that has not educated their people about our brutal past. Are you serious? The only country on that list better of than us is Barbados, the others still struggling. When countries have more of there citizens living overseas than whats at home, how can they be better of than us. Not saying that the BVI have it great but we're still better off. If you doubt me, ask Immigration and even some expat about the line of people trying to enter the BVI. If the country so bad, how come when you all get here, trying to sent for family and friends to come join you. Answer that for me. Lookup please shut up and listen up!All of those countries can't stand on their own. Who you think sustains them? Ask the big countries (US/UK/China) how much money they lent to those countries recently? You think they're totally surviving on tourism, exports and local commerce. Read and get a clue! $2.70EC=$1USD/ $2BBD=$1USD/ $1GYD=$.48USD/ $1JMD=$.78USD Right now BVI is 1:1. Let's think here! We export nothing. Forget shopping in St. Thomas. Independent bvi dollar would hold no weight. As a BVIslander, I know that this territory is not ready for independence and certainly not under the leadership of the current NDP Government. The people need to be consulted and their informed views must be taken into consideration. Please don't try to push the BVI into a state of confusion through selfish and greedy ideals. Does this good minister understand what independence is all about? You must first get your house in order. Let the NDPGovernment know we must first have honesty and transparency . Freedom of information must come first. Taxpayers money must be spent with reason.No kickbacks, no bribery, no pocketing. People must have freedom of speech and crimes must be eradicated from this small territory. Members of the house of assembly must be Virginislanders with an indigenous background. The peoples voices must be heard and decisions made must come from the people and not a few men in cabinet. Lots of house cleaning must be done before we seek independence. Go independent and the country will be bankrupt in no time....stay the course. When are we going to grow up? Are we going to continue to be young tings who cannot leave her mother? We can do financial services, we can do tourism, we can educate our own, we can bake cherry pie in the twinkling of an eye, but we shall always be young tings who cannot leave a people who brutally enslaved our people. There is nothing to fear about. Let us start the conversation. The UK and its residents will be worst than any of our politicians. Let them kick us off and ask ourselves if we will swim or float. Or is the UK looking for a haven to stash its almost displaced citizens. Not here! Not the Virgin Islands. We are not returning to that era. At the end of the day it will boil down to them and us. They will not settle until they can rule us again. We will not rest with them ruling us again. One way or another, a decision must be made. The people who first enslaved some of your ancestors are not around today. There are English people in BVi but they have a whole host of ancestors from the greater Caribbean, Europe, Asia, Africa and each one has their own family story. They certainly have not enslaved people and have only brought business and opportunity to the BVI. England itself offers some support and stability and otherwise is not minded to get into affairs generally of the BVI unless somebody is trying to perpetrate a significant wrong against the people. Why would a England otherwise care to get involved? There is no benefit to England ruling the BVI. There is no oil, no strategic outpost or military advantage. If England ceased to have BVI as an OT, presumably followed by taking the a courts out of the chain to the Privy Council and business will leave overnight (what's left), ask Bahamas, Bermuda where the hedge fund industry is. It would only hit the news when the civil unrest and the social decline and the poverty became for some reason newsworthy one day. This talk is just twisting arguments. If we get out stuff together, our governance, our systems and infrastructure and a proper plan to retain and build on what we have, including keeping and largely growing the expat community and making permanent residence less opaque and within ten years, in order to have the numbers of workers required, the maybe somehow the wherewithal would be there to do it. Until we are anywhere near that, it is shooting ourselves in the foot. It's a big wide world out there, the US doesn't need any more territories to look after as they are struggling with what they have and PR is bankrupt. Therefore if we are going to trade to survive, a massive change of attitudes to foreigners and, yes non-blacks, will be necessary or the notion is dead in the water and our economy and livelihoods and way of life with it. On the slavery subject, the BVi through successive governments has received billions of dollars (those pesky Brits with all of their positivity and business and jobs and buying things and renting property) in revenues. Has the BVI got a world class education system launching kids into the world's leading universities or to be entrepreneurs and professionals? Is the standard of healthcare second to none? Great roads built by people who know what they are doing? Does the water and sewage and electricity and telecomms system work well? It seems the BVi needs a new emancipation from the old ways where money doesn't just leak and leak in return for votes and favours. Education is where it must all start for our youth to have the best and the widest choice of chances in the future. What I've gathered from all the comments is that an independent. BVI is light years away..Physically we may be grown men but mentally we're still like babes. It's gonna be hard to change that mindset. You can't leave your mother's house if you can't fend for yourself. It's that simple. He need to be saved ,and speak to people about salvation and baptism in the name of the LordJesus Christ and playing the fool. Ever learning but never to come to the knowledge of Christ Jesus. Isn't he living high off THE BAPTIST CHURCH? How independent is he? He should show example with Turnbull's Missionary. Heads of Churches should use the pulpit to spread the word of their faith and religious convictions. Politics and especially "personal" political believes have no place there. Please use another forum.